Yana is a Sanskrit word with a range of meanings including nouns such as vehicle, journey, and path; and verbs such as going, moving, riding, and marching. In the Indian religions Buddhism and Hinduism, both yana and marga (road or path) express the metaphor of spiritual practice as a path or journey. Ancient texts in both religions discuss doctrines and practices associated with various yanas. In Buddhism, yana often augments the metaphor of the spiritual path with the idea of various vehicles that convey a person along that path. The yana/marga metaphor is similar to the Chinese image of the Tao (path or way) but Indian and Chinese cultures appear to have evolved such similar metaphors independently. The use of yana to refer to a spiritual journey may date to the Rig Veda, possibly composed circa 1500 BCE, whose 10th Mandala makes several references to devayana, (translators usually render this as the «path of the gods» or similar) and one reference to pitryana («path of the fathers»). The first verse of the Rig Veda’s burial hymn (10.18) translates approximately as «O Death, take the other path, which is distinct from the way of the gods» (paraM mRtyo anu parehi panthAM yaste sva itaro devayAnAt). The «other path» is the pitryana, referred to in hymn 10.2 and alluded to in 10.14 and 10.16. The devayana and pitryana evolved from the ancient Rig Vedic concern for immortality to the classical Hindu concern with ending samsaric existence. The Upanishads, which comment on the Vedas, make further reference to devayana and pitryana. Among other distinctions, the pitryana was said to refer the religious practices of villagers, and the devayana was said to refer to the practices of recluses living in the forest. The (II.iv.11 and IV.v.12) also makes reference to ekayana, notably in the phrase vedAnAm.h vAk.h ekAyanam, which translates approximately to «the Vedas are the direct path to the spirit of the word». Buddhist use of yana emerged from the pre-existing world-view of Sanskrit culture. The serves as an example of the early use of yana in a Buddhist context. In this classic text attributed to Shakyamuni, the historical Buddha prescribes a number of meditation techniques; near the end of the sutra, the phrase Ekàyano ayaü bhikkhave maggo... appears. This passage translates approximately as «This is the direct way along the path of purification..». Thus, Nikaya Buddhism expressed at least some contrast between yana (yano in this Pali syntax) and marga (maggo). A clear distinction between vehicle and path arises in Mahayana texts, notably Chapter three of the Lotus Sutra, which relates a parable of a father promising three carts to lure sons out of a burning building, corresponding to the three types of Buddha. In the parable, the goat-cart represents Sravaka-Buddhahood; the deer-cart, Pratyeka-Buddhahood; and the bullock-cart, Samyaksam-Buddhahood. The sutra goes on to say these that the teachings of the three vehicles are merely expedient means (upaya)—essentially, a white lie. Their purpose is to direct people toward ekayana, the one vehicle, depicted in the parable as a jeweled cart driven by a white ox. Yana has been used subsequently in a number of schemas of the Mahayana Buddhist teachings in which there have been two, three, five, six, nine, and more vehicles. As stated above, the idea of a «direct path» or «only way» was expressed in the Upanishads, and reiterated in the Pali canon. Mahayana texts such as the Lotus Sutra and the Avatamsaka Sutra sought to unite all the different teachings into a single great way. These texts serve as the inspiration for using the term Ekayana in the sense of «one vehicle». This «one vehicle» became a key aspect of the doctrines and practices of Tiantai and Tendai Buddhist sects, which subsequently influenced Chan and Zen doctrines and practices. Traditionally, the two vehicles in Mahayana Buddhism consist of sravakayana and pratekyabuddhayana. These in turn refer to doctrines and practices that supposedly aim at becoming two of the three types of Buddha. Mahayana Buddhists take a vow to become the third type, namely bodhisattvas. Therefore Mahayana Buddhist texts sometimes use terms like «followers of the two vehicles» to refer to Buddhists who do not accept the Mahayana sutras. Some Mahayana sutras consider that the two vehicles together comprise the Hinayana—literally, inferior vehicle; sometimes, small vehicle. Modern texts sometimes refer to Mahayana and Hinayana as «two vehicles». But referring to an «inferior vehicle» may disrespect Buddhists who do not consider the Mahayana sutras to be the word of the historical Buddha. More commonly, Theravada refers to most non-Mahayana Buddhists in today’s world. Nikaya Buddhism refers to both current and historical Buddhists who did not accept the Mahayana sutras. Sravakayana: The Hearer vehicle: A path that meets the goals of a Sravaka-Buddha, who achieves liberation after listening to the teachings of a Bodhisattva Buddha. If no Boddhisattva is present in the world, Sravaka-Buddhas cannot discover the dharma. Pratyekayana: The individual vehicle: A Solitary Buddha (Pratyeka-Buddha) achieves liberation, but does not teach other beings. 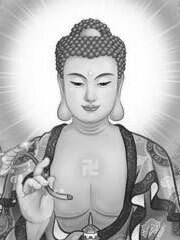 Pratyeka-buddhas do not depend on a teacher and can discover the dharma even if they do not encounter a Bodhisattva. They are sometimes said to remain silent and solitary. Bodhisattvayana: The Samyaksam-Buddha attains liberation and wishes to benefit as many beings as possible. In order to aid others, they vow to remain in the world, and defer their chance to end the cycle of rebirth. A second classification came into use with the rise of the Vajrayana, which created a hierarchy of the teachings with the Vajrayana being the highest path. The Vajrayana itself become multilayered especially in Tibetan Buddhism. This is a Mahayana list which is found in East Asian Buddhism. The five yanas plus the Vajrayana. This schema is associated with Shingon Buddhism in Japan. It was invented by Kukai in order to help to differentiate the Vajrayana teachings that he imported from China in the early 9th century. Kukai wanted to show that the new teachings were entirely new. The Nyingma school of Tibetan Buddhism has nine yanas, a list made by combining the first type of three yanas, and adding the six classes of tantras. Upatantra (Tibetan spyod rgyud) ‘practice tantra’ and the Ubhayatantra (gnyis ka’i rgyud), ‘dual tantra’, because it practices the view of the next vehicle, Yogatantra, together with the action of the former.